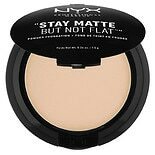 Shop NYX Professional Makeup Stay Matte But Not Flat Foundation Powder Natural (.26 oz. ).26 oz. Shop Rimmel Stay Matte Pressed Powder Deep Beige (.49 oz. ).49 oz. Help reduce shine, cover blemishes or create a base for lasting wear of your makeup with matte powder foundation. 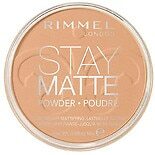 Powder foundation can offer the shade and coverage you desire with the lightweight softness of powder. Some foundations are even hypoallergenic, oil-free and noncomedogenic, so they won't clog pores. 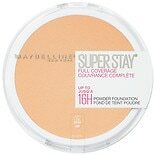 Select your matte powder foundation from Maybelline and more here at Walgreens.com. 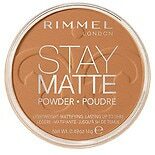 In addition to matte powder foundation, you can find other cosmetics here, from lipstick to pressed powder and more. There are a range of concealers to help find one that closely matches your skin tone, as well as tinted moisturizers to help hydrate and lightly cover. You'll even find different types of makeup applicators to help your makeup look its best, from cosmetic brushes to puffs, wedges and cotton swabs.